Have you heard about the Holiday events going on at Six Flags?? I had no clue that there was winter activities at Discovery Kingdom! They have snow sledding, cookie decorating, some of the rides are still open, a winter wonderland and a tree forest. Sounds super fun! Plus all great food and the shows with a holiday theme. We went for the Halloween event and loved it, I am sure this Holiday in the Park event will be amazing. I can't wait to see the huge Christmas Tree and the park lit up. Holiday in the Park at Six Flags Discovery Kingdom! 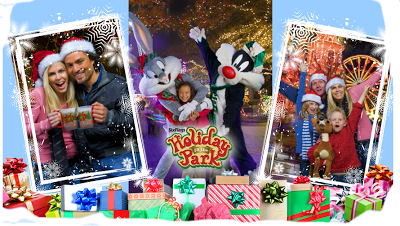 From Now Dec. 20th to January 6, Holiday in the Park turns Six Flags Discovery Kingdom into a magical holiday adventure. The best holiday festival in Northern California features beautiful décor, charming family activities, delicious treats, enchanting shows, dreamy rides, and lots of holiday cheer. Stunning Decorations At Holiday in the Park, Six Flags gets lit up with over a million colorful twinkling lights wrapped around trees, buildings, and rides. The highlight of our seasonal décor is the large 65-foot-tall Christmas tree that towers over the main plaza and ignites the park. Joyful Activities Our playful Holiday in the Park activities will trigger your imagination and bring out the kid at heart. Take a slippery slide down the snowy Blitzen’s Wonderland Mountain, brighten your mood with a stroll through the Main Street Festival of Lights, toast up by the Holiday Fire Pits, drift into dreamland on Candy Cane Lane, meet your favorite gifts in Toy Land, wander through the inspirational Christmas Tree Forest for an elegant display of holiday spirit, and embrace the season in Winter Wonderland. You can also make a visit to Santa's Workshop and the Reindeer Village to meet Santa, Mrs. Claus, a few friendly elves, and the nine magical reindeer. Don't forget, you can also create your own sweet treat in the Cookie Decorating Room. Holiday Shopping Make your list and check it twice, because Six Flags Discovery Kingdom is also a great place to complete your holiday shopping. You can find unique holiday gifts, including apparel, decorations, and park souvenirs, at the Kingdom Market, Sea Riggin’, Land Fitters, or Sky Supply. Festive Foods Mrs. Claus and the elves have been working hard in the kitchen to concoct lots of delicious goodies. In addition to your traditional favorites, like funnel cakes, ice cream, hot dogs, burgers, barbeque, and pizza, Holiday in the Park will feature some of your favorite seasonal treats. Warm up with flavored coffees, hot chocolate, cider, or soup and chili in sourdough bread bowls. Indulge in sweet snacks like caramel apples, candy canes, kettle corn, and cinnamon-roasted nuts. Other holiday food favorites include roasted corn on the cob, smoked turkey legs, creamy eggnog, jumbo soft pretzels, chowder, and churros. Seasonal Shows You can also sing and dance to your favorite Christmas carols in our delightful holiday shows. Enjoy a joyful dinner theater presentation in Happy Holidays, party with pop versions of classic holiday hits in Jingle Bell Rock, dance with the characters in Looney Tunes Christmas, watch our Dickens-style Discovery Kingdom Carolers, taunt with the E. Ben Geezer Puppet Show, or end the day rocking with Cool Yule. You can also catch our exciting animal shows as they celebrate the season in A Dolphin Holiday and the Sea Lion Express shows. When it gets dark, don’t forget to dazzle the night with the electrifying Christmas Tree Lighting Ceremony or stunning pyrotechnic spectacular on New Year’s Eve. Chilling Rides And of course, don’t forget to fly like Santa and take a cruise through the sky on Kong, Medusa, SUPERMAN Ultimate Flight, or V2: Vertical Velocity. You can also feel the chill of the night like you are on a magical sleigh ride and soar 15 stories up on the SkyScreamer. The adrenaline rush is sure to warm your heart and pump you up for a day of winter fun. What’s your favorite part of Holiday in the Park? * I was not paid for this post. We will be guest of Six Flags Discovery Kingdom for Holiday in the Park.